Practical and durable, our dopp kit is ideal for journeys abroad or even just using it as a daily carry-all. It has been crafted in Italy from wool felt from Piacenza and leather trimming in contrasting orange hue. 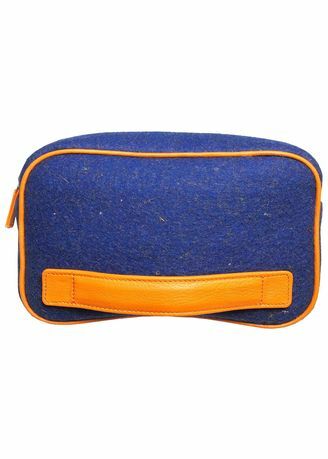 Equipped with ample space for small toiletry container and an external sleeve secured with a self-centering magnetic clasp, this sleek pouch is designed to keep essentials in order when on the move. Slip hand through the external side loop for a secure grip.